As some of you may know, I am a college student, and like all college students, the semester has started again. Classes, rehearsals, homework, etc. 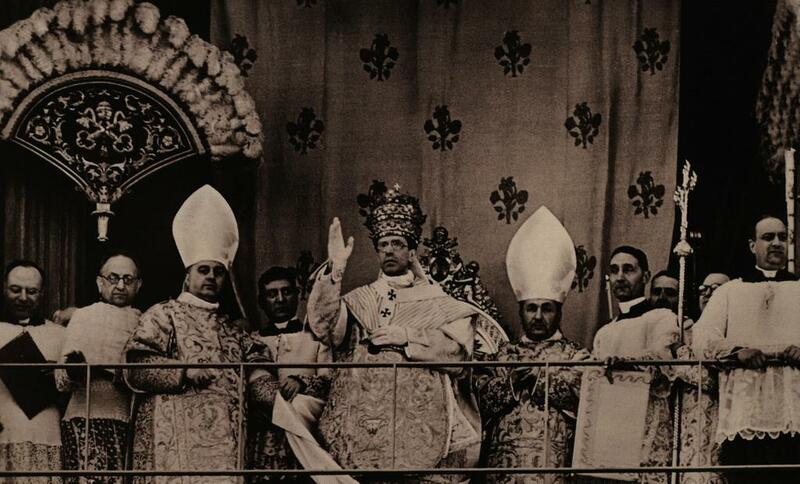 So, in the mean time while I make my final adjustments to the "Offertory" section of the "Novus Ordo Compatibility to the Tridentine Mass", I leave you with the first Apostolic Blessing of Venerable Pius XII after his Papal Coronation. And yes, I'm a Catholic monarchist! One of these days I will go on a blogging rant about how I wish the Papal coronation should come back into the Church and why I think it's necessary! If the Supreme Pontiff is suppose to be the Crowned Prince of the Church and the temporary ruler of Christ's Church on earthy, I truly believe this can ONLY be fully realized through the re-introduction of the Papal coronation and the Papal tiara! It's time for Catholics to finally realize that the "Church of the Nice" (Michael Voris quote from the show "The Vortex" on ChurchMilitantTV) is not the Church by which Christ Himself founded nor was it the Church that was present on this earth prior to the Second Vatican Council. The Church was respected as an institution of moral stability and the defender of truths. Bring back true, authentic Catholicism, founded upon the teachings of Christ's Church that has lasted for 2000 years. Bring back the truth of the full reality of the Supreme Pontiff's role in the Church from not only being the Defender of the Faith and the Successor to the THRONE of Saint Peter, but also the Temporary Ruler, the Crown Princes of the Princes of the Church, that rules the Church with the authority vested in him by Almighty God with the fullness of the Christian Faith, the Catholic Church.